It may look complicated when you see a song described as “AABA” or something similar, but it’s not. To start, consider the first melodic segment you hear (not including the intro) as “A.” The next complete melodic section that has a melody different from “A” is designated “B,” the third “C,” etc. Repeats of any melodic segment get the same letter they got the first time. For 4/4 time: 1-2-3-4, 2-2-3-4, 3-2-3-4, 4-2-3-4, etc. For 3/4 waltz time: 1-2-3, 2-2-3, 3-2-3, 4-2-3, etc. A A B A Here’s a more graphic way to lay it out quickly so you can easily add extra bars and make notes. Each of the slash notes represents a beat (in 4/4 time). Try this exercise with songs on the radio. It will give you a repertoire of basic forms and, more importantly, it will show you a wide range of variations that work, such as extra bars of music between sections and unexpected chord changes. Even though you’ll find the forms falling into predictable patterns, the variations often give the song the sense of surprise that makes it special and exciting. Note how the form contributes to the memorability of a song by helping it achieve a balance between predictability and surprise, repetition and new information, all within a commercially acceptable time limit. This is an old form, used commonly in traditional folk music but rarely with good results in contemporary songs, because there is no chorus or bridge to help sustain melodic interest. The title line usually appears in the first or the last line but occasionally, there are two repeated lyric phrases, one in the first and one in the last line. The form can have any number of verses. You might use this form if you had a lot of important lyrical content, but wanted to eliminate the time spent repeating choruses. In the absence of a chorus that “sums up” the song, you’ll want the verses to end with a dramatic kind of “payoff” line. EXAMPLES: Johnny Cash, “I’ll Walk the Line”; Bette Midler, “The Rose” (Amanda McBroom); “By The Time I Get To Phoenix” (Jimmy Webb), Bob Dylan’s “The Times They Are A Changin'” The following examples are AAA form melodically, although they contain a chorus lyric that repeats: Bruce Springsteen’s “Born In The USA,” “Achy Breaky Heart” (Don Von Tress), Goo Goo Dolls “Iris” (John Rzeznik). VARIATIONS: There are variations of this form, like Don Henley’s “Dirty Laundry,” which uses a short refrain between every couple of verses. It’s not a standard AAA because the refrain isn’t a part of the basic melodic structure of the verse, and the refrain isn’t a chorus because it’s very short and does not contain the hook line (which is contained in the verse). Musically, Bruce Springsteen’s “Born In The U.S.A.” is an AAA: although it has a chorus, its melody is the same as the verses. That’s very unusual, and if you had written this song instead of “The Boss” and you weren’t already a successful artist, your publisher probably would have demanded a rewrite. Without a powerful performance, the song would be musically boring. Another variation of the AAA form is an extension created by repeating part or all of the last line. It’s usually referred to as a “refrain.” This special focus on that line however, makes it important that it be the title line. A short instrumental section or melodic instrumental hook can be used to break up the potential monotony. CAUTION: You need to be very careful to make the melody as interesting as possible without making it too complex to be remembered easily. This is generally accomplished with a melodic variation in the last two melodic lines of each verse. Hum any of the examples mentioned to see what I mean. AABA is a classic song form with a long and popular history. At one time, it was considered the ultimate song form: it’s short, concise, melodically seamless and easy to remember. It is used in all styles of music and all tempos, but most frequently in slow or mid-tempo ballads, because its 32 bars (four 8-bar sections) make for a very short song at fast tempos. Variations have developed which can accommodate faster tempos and the need for more room to tell the story. You’ll find your own as the need arises. Hook/title placement is usually in either the first or last line of the verse but it can occur in both (like “Yesterday”). You’ll hear songs in which the title will also be recapped in the “B” section, although the objective is to go to a totally new place in that section both musically and lyrically. Note that despite it’s illustrious history, the AABA form is not usually considered the most commercially viable and most of the ones you’ll hear are written by the artists who perform them. When given a choice, most producers will choose to record a song with a repeating chorus. The varieties of this most popular form provide a maximum of chorus repetition and two or more verses to tell your story. Version #1 gives you a maximum verse and chorus repetition. A potential problem is that, if you have a lot of melodic repetition within each verse or chorus, such as an 8-bar section made up of three 2-bar melodies with a slight variation in the fourth 2-bar melody line, you may have too much repetition. In that case, #2 with the substitution of a bridge for the third verse helps to break it up. Version #3 with the chorus first can give you more repetition of the chorus in a shorter time. The choice of whether to start with a chorus depends on the lyric development of the song. If it’s important to generate a dynamic opening to the song, try the chorus first unless you want the verses to build interest and suspense and “set up” the chorus as a “payoff.” Many 60s Motown hits used variations of this form. It’s always a good idea to give it a test by switching the verse and chorus positions to see which works best. #4 with two verses in front is also a much used form. Its workability depends on a very strong lyric continuity between the first and second verses to offset the delay in getting to the chorus. This is a much greater problem in a slow ballad than an up-tempo song because of the additional time it takes to get to the chorus. Every word has to propel the story forward. Repetition of information is deadly. If each of the two verses cover the same information in a different way and don’t depend on each other, this may not be the best form to use since you should have a very important reason to delay the chorus. If you do need to use two verses, you may want to look for some arrangement devices or write a variation of the first verse melody to help sustain musical interest in the second verse. You could also consider using your title in the first line of the chorus to avoid even further delay in reaching the hook line. Variations of this form opening with three verses (AAABAB or AAABAAB) are rare and the two examples that come to mind; The Eagles’ “Lyin’ Eyes” (Don Henley/Glen Frey) and Kenny Rogers’ “The Gambler” (Don Schlitz) both have such exceptional lyric continuity that a chorus any earlier would be an unwelcome intrusion. You’ll also occasionally hear an AABAABB variation, particularly on up-tempo songs. Again, those choices will be different for each song but the guiding principle is that you don’t delay the chorus unless you have another good way to sustain the listener’s interest. ABC ABCD ABCD, the “D” being a bridge with a new melody, with or without lyrics. Even when your songs come spontaneously, there is a point at which you need to decide which form to use. 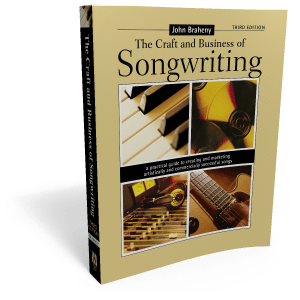 Usually writers will come up with a single verse or chorus idea first. After that first flash of inspiration and an exploration of what you want the song to say, you’ll need to have an idea of the type of form you’ll want to use to help you say it more effectively. You may do that unconsciously, as a natural result of having listened to the radio all your life — you just feel where there ought to be a change without really making a conscious evaluation of the reasons. That approach can works just fine, but sometimes it doesn’t, like a beginning guitar player who writes monotonous two chord songs because he only knows two chords instead of learning a few more chords. You have to remember that what you already know or feel about form could be limiting. Another problem in choosing form by “feel” is the songwriting equivalent of “painting yourself into a corner.” You might lock into a form that, by the time you’ve said what you wanted to say, has resulted in a five-minute song that you really wanted to be three minutes. You’re now faced with a rewrite that might include a restructuring of the whole song. It’s much harder to get out of a corner like that than it is to set it up better in the beginning. Even if you do have to restructure the song because the form you chose didn’t quite work — or you had another idea halfway through the song — the important thing is that you make those decisions on the basis of knowing your options. So what do you consider in your choice of form? If you’re starting with the music, tempo is a major factor in dictating the form. If it’s an up-tempo song, you may need a form with many sections (like an ABCABCDC or AABABCB) to help you sustain musical interest. If it’s a slow or mid-tempo ballad, you can use either the shorter forms or the longer ones but may have to shorten the sections. If you’re starting from a lyric, the mood and subject matter will dictate the tempo of the music. In other words, “Genie In A Bottle” wouldn’t work very well as a slow ballad, and the lyric to the Titanic theme “My Heart Will Go On” wouldn’t be as effective in a fast dance song. Tempo is also determined by the ease with which the lyrics can be sung. The problem usually arises when there are lots of words. If the tempo’s too fast, you may tie knots in your tongue trying to get them all in. If you want a rapid-fire one-syllable-per-8th or 16th note lyric, you have to be extra careful that the words are easy to pronounce and sing together. It’s a good idea to experiment with a metronome by singing the lyric against various tempo settings. Fewer words generally pose fewer problems, but the challenge is to phrase them in an interesting way against the rhythm. There are other tempo variables available, due to the fact that you can have a slow moving lyric and melody over a double-time groove. Whichever way you choose, once you’ve set the tempo and determined how many lyric lines will be in each segment, you’ve begun to lock yourself into the form. If it takes one minute to get through a verse and chorus, and you’re looking for a three minute song, your options have already shrunk. You must also consider the amount of lyric needed to tell the story. Though it’s always a good idea to condense, the AAA form gives you the most room to stretch lyrically, even though, as I mentioned earlier, it’s not the best form from a commercial standpoint. Any up-tempo three or four-section form can give you plenty of lyric space with strong musical interest, particularly if you use pre-choruses for new lyric information each time. One-section (AAA) and two-section (ABABAB) forms at fast tempos, though they allow for a maximum of lyric information, can be melodically boring because the melodies repeat so often. With a spare, condensed lyric, you have many options. You can lay them over either an up-tempo track or a slow ballad and, in either case, have plenty of room to accommodate the individual phrasing styles of different singers. You can use any form and insure a maximum amount of both repetition and musical interest. However, a spare lyric at a slower tempo has more of an obligation to be interesting. You’re making the listener wait for that lyric to unfold, and it had better be worth the wait. The same is true of the music. Eventually, like anything else, once you’ve worked with these forms, they’ll become second nature to you. You’ll also find that you will get yourself into problematic situations for which you will find creative solutions. A substantial amount of innovation in music is initiated by a need to find a graceful way out of a jam. If you already have a repertoire of solutions, you’re ahead of the game.